The final straw I think was the fight they had over dinner. When Mia missed him and then he tells her that going on tour was what his work was going to be. But I kind of feel that it was only Mia who broke things up, and that Seb was trying his best and didn’t want to break up. I wonder if the breakup was really inevitable. I just saw this movie two days ago, and I’m still wrapped in its wonder. Frankly, I don’t want to answer any of those questions or go down any of those roads. I want, for as long as it lasts, for me to continue loving those people, hurting when they hurt, hoping when they saw alternative possibilities and thinking that one day they’ll re-find what they lost and make it work somehow with her children. I totally agree. Everything that was said about jazz could be said about rock and roll. It’s not as though history and culture aren’t important, what does every musical have to address the history of its genre? I absolutely loved this movie and the points you are bringing up here are very interesting! For me, I definitely think that the pivotal moment that ruined their relationship was Seb agreeing to join The Messengers – essentially ‘selling out’ and making it impossible for the two to maintain the bond they had formed based on their shared status as struggling dreamers. However, Seb would never have made enough money to open the jazz club otherwise, so I think they had to sacrifice eachother to pursue their careers and avoid the inevitable resentment that would have occurred had they held eachother back. Such a brilliant movie! I just saw the La La Land last night with a friend…she was blown away by the opening single tracking shot. I’m interested in watching it a few more times…it’s that kind of movie. The undertone of grittiness permeates the story, they are both in constant struggle…the dancing and even the songs were ever-so-slightly-strained because two young white actors were perfectly surreal in these parts. The numbers were really well done, but slightly off somehow which always happens to a certain degree with classic to contemporary stuff. I got the sense that the story was designed to operate at cross layers…go places it wasn’t supposed to go…it’s what makes it magical. As far as the romance goes, I wasn’t all that upset by the way things turned out. They both got swept up in each other as a catalyst for their aspiring creative pursuits…it’s what makes young love a rocket you can only ride for so long. I’m glad it ended the way it did too. And I’m also dying to see it again. I love Ryan Gosling and Emma Stone. I went to see the movie in part because of those two actors. Still, at the same time, I wished they had cast singers who can act instead of actors who can sing. I loved the opening sequence – and I especially loved how many of the scenes were shot with long takes. However, I was disappointed that there weren’t more large numbers in the movie. I was also disappointed that there weren’t larger singing roles for supporting cast members. I don’t know how you can mention this movie without commenting on Ryan Gosling’s amazing fake piano playing skills! The movie makes use of only a few songs that are riffed on as the movie goes along. However they’re really good songs. It was was a throwback to the musicals of the thirties and forties, and for that reason it was one of my favorite movies of this past year. I hope Hollywood makes more movies like this. However, it will never be my favorite musical. I don’t know Jay about the last paragraph, I think I’m getting old and conservative as time marches on. Jazz belongs to African Americans. That should remain true and known to the end of time but I was very happy to see Gosling and Stone in this film. Michael B. Jordan and Zoe Saldana couldn’t done it but I’m fine with Gosling being a passionate white jazz musician and maybe that apathy is why things change slow. Maybe I’m the problem or maybe I just accept there are white jazz musicians out there. The “unhappy” ending surprised me and I kind of rebelled against it but like all such endings it has a power that stays long after the credits. I took it very much as an example of why those old saloon singers sing those sad love songs so well. Because they’ve all got a story or two that goes just like the song and this was his story. I’ve had a few discussions though about how it could be happy ending because they get professionally what they want. I’ve seen too many people speak about relationships taking precedence once they get to the end of middle age and realise the futility of professional success to think that the film has a happy ending. But how we measure a successful life is truly for ourselves to decide and so it is with these characters too. The insights that you and Sean have mentioned about the pacing and mise-en-scene of the film reflecting relationships I think rings true and I thank you very much for sharing them. Has allowed me to take a deeper look at it. You ask some thought provoking questions here. I’ll answer a couple as I need to think about the others more. I’ve just been writing about my experience watching too. Overall I didn’t feel it (though I need another look considering its awards season momentum and it has made me ponder). I really felt it built well from the 3rd season onward. The last season particularly was affecting with the fantastical -what if – sequence. I was honestly really bored in a lot of the first two seasons. Some clever parts though underwhelmed. I’m an avid film junkie, and awards season follower, so I suppose I’m a hard man to please. When something works it works. Particularly with stylized works such as this. There was something amiss about his one. Perhaps it’s the organic thing you are getting at about the cliche love moments and moving from speech to song? That’s basically what musicals are meant to do. When there’s no where else to go, you sing. This worked in parts. Say Emma Stone’s audition piece (so good). This felt organic. Anyway, I’ll have a think about the rest. Stone has a realistic chance come Oscars time. She actually grew into the role as it progressed. Perhaps that was the point? She’ll be nominated for sure. I’m thinking Natalie Portman will win. I haven’t seen Jackie yet but my jaw was open the whole trailer. Best actor is harder. Ryan Gosling could get a nomination though wouldn’t be shocked if he doesn’t. His role and performance didn’t do it so much for me. He’s a fine actor and did better with the dancing than Emma. It’s a quieter role. This may transcend or not. Regarding who else could’ve done the roles? It’s tough. I think they were cast well. The roles require a youthful quirky freshness. Michael B. Jordan with Alicia Vikander would be cool. Yes! I could really see that. Loved La La Land – I just saw it last weekend and left in tears. So many great questions you’ve raised..to me, the beginning of the end seemed to appear during the “sell out” phase. Though ultimately, as much as it’s about ambition overshadowing love, it’s also about timing. Had they met a few years later..in any case now that I’ve seen the movie I can’t imagine anyone else in it. 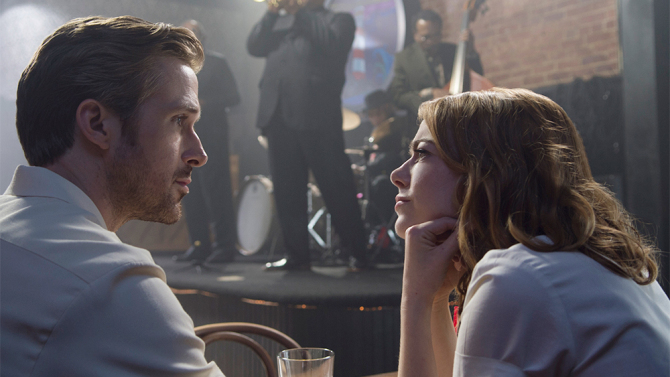 Ryan Gosling and Emma Stone nailed it. The first 10 minutes I thought I was going hate the film and then I fell in love with it. Reality vs. non-reality being conveyed through music, dreams, ambitions and yes – La La Land was the third character. What a brilliant little film. Great movie! 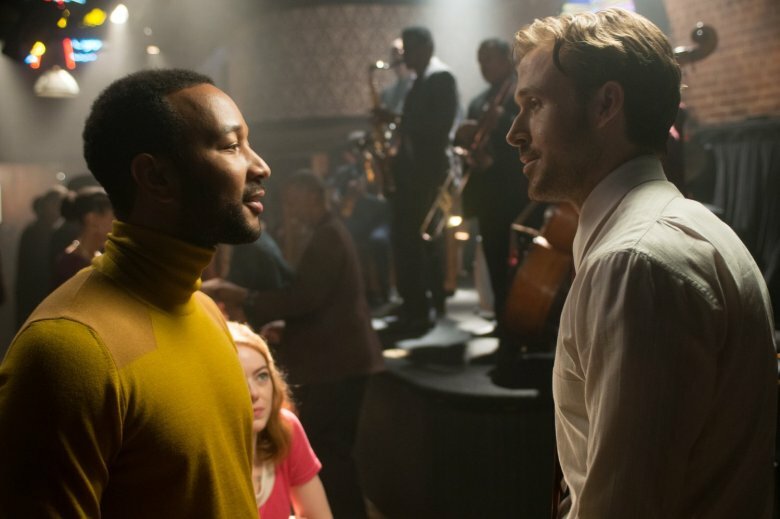 I think if anything, John Legend is portrayed as the “savior of jazz” in the movie. Granted, he had a more minor role, but his character was of more cultural significance. Anyways, nice post! Stay tuned for our jazz feature coming out tomorrow! It’s focused on a brilliant contemporary musician.